The Expanded Zephyr Express is the ONLY starter set with its simplicity, wide variety of advanced features, and a clear positive upgrade path to bigger and better things without obsolescing anything. 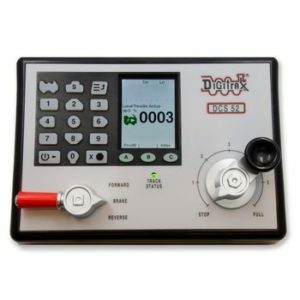 It is the Absolute Best Entry-Level System and makes a Great Add-on Yard Throttle and Booster for existing Digitrax systems. 2 Basic Locomotive Decoders (HO DH123D or N-Scale DN135D) your choice. Command Station, Booster, and Throttle all contained in one “Console” station. 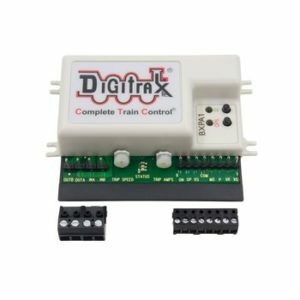 Accepts all Digitrax throttles: plug-in & walk-around, Infrared or Radio throttles. Operate up to 20 throttles (engineers) at one time. Mute Key used in conjunction with DCC sound decoders to turn the sound on/off. Separate programming track allows programming in any mode while layout continues to run. OPS-Mode programming. The Zephyr throttle display will not do OPS-mode read back. Braking feature that allows you to set and release the brake with a lever on the console..